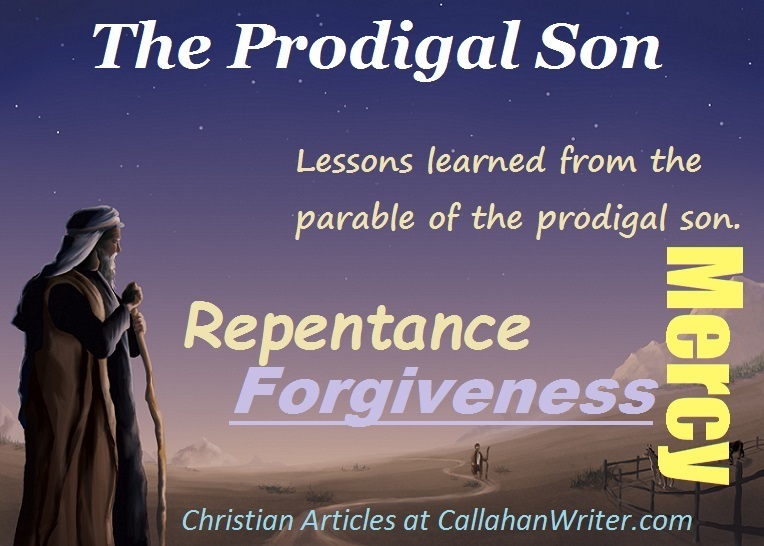 repent | Troy C. Wagstaff aka CallahanWriter Blog: Topics of interest include Western Historical (1865-1899) Topics. Additionally inspirational Christian and Fibromyalgia interests. Do We Have To Bear Our Grief And Sorrow Alone? We know that our Redeemer has redeemed us from sin by paying for those sins while He suffered in the Garden of Gethsemane and on the Cross of Calvary. If we repent for those sins then the ransom that justice demands is paid for. We no longer carry the weight of those sins around. It’s like we had never committed those sins. Repenting is like having a great burden taken of you shoulders. Just as sin can weigh us down, so to can sorrow and grief weigh us down. The same can be true of our griefs and sorrows. Christ The Lord, has born our grief’s and carried our sorrows already. Why do we insist on bearing them ourselves? We can come unto Jesus and let him help us through our sorrows and our grief. We do not need to face those feelings alone. As repentance requires effort on our part, so does overcoming grief and sorrow. We have to put for effort toward overcoming out griefs and sorrows asking The Lord to help us. As we open the door to The Lord in our trying times, he can bear us up and give us comfort as we strive to overcome. But we have to open the door to Him first. How do we apply this scripture in our lives? If we are disciples of Jesus Christ then we are the branches that are bearing fruit. The branches that are not bearing fruit are everyone else that is not a disciple of Christ. This paper will look at the branches that bear fruit, those of us who choose to follow Jesus of Nazareth. Meaning of purge is to remove or cleanse. If you have a fruit tree, you want to harvest the fruit of the tree. That is the measure of its creation, to put forth fruit. You remove any and all branches that do not produce fruit. The branches left are the ones bearing fruit. With those fruit bearing branches you prune them after the harvest. To prune them is to strategically cut the branches back so that they will devote the energy of the tree to producing more fruit the next season. That’s also why you cut the worthless branches off. Doing all this work to a fruit tree takes an average fruit tree and makes it far more valuable by making it produce much more fruit. Doing this yearly keeps the tree healthy and productive. Every year some branches will die off and new branches will grow. It becomes a cycle that will keep the tree alive for a long and productive time. As fruitful branches of the tree we have to go through the pruning process, on a regular basis to be even more fruitful, and thus more valuable. Applied to us, we grow as we get pruned by the caring, expert fruit grower. Christ knows our potential and He knows how to guide us to that potential, through expertly crafted trials and tribulations. Having said all that, not all trials and tribulations come from The Master. Some trials come from the consequences of bad or sinful choices. If we are humble and repent for those sinful choices we can learn from those consequences and become fruitful again. There are other types of trial and tribulation that come to us through no fault of our own. We can grow and become more valuable and a stronger Christian through The Lords helps. It’s up to us to determine the source of the trial just as it is up to us to determine how we respond to the trial and whether or not we will allow ourselves to grow according to The Lords will or get tired and rebel against The Lord. But rest assured that for whatever trial or tribulation we go through, we can make it purposeful and fruitful if we go through it with The Lords help and let His master hand guide to the right outcome. IF IT IS TOO GOOD TO BE TRUE, THEN IT IS? 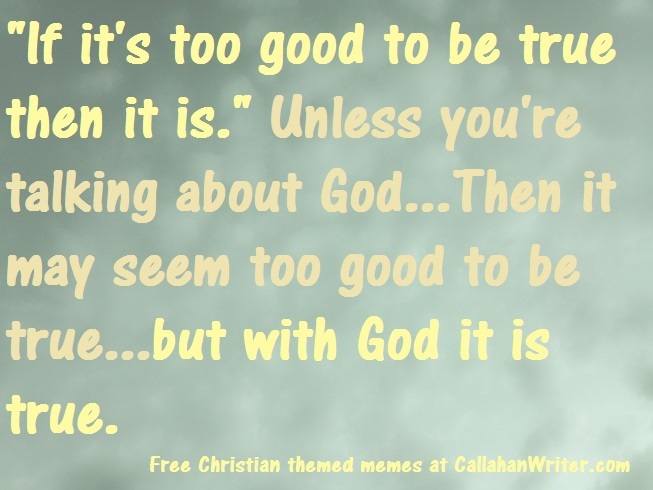 We’ve all heard the old adage that “if it’s too good to be true” then it is. However, I take issue with that aphorism, I say that if it is too good to be true it probably is, but not always. Let’s take the following story as an example to the exception of this adage. Imagine that you have lost all your worldly possessions, you’ve lost your family and you have been living in the street for ten years. You have no income forcing you to beg for money and food, and you sleep for wherever you can find shelter. Let’s add to this sad scenario, a substance abuse problem. You have many illnesses related to exposure to the elements, poor diet and substance abuse problems. It all seems hopeless and it all seems lost! Surely, there is no hope. You have been raised right, you know that you not supposed to steal or lie. Living on the streets has jaded you. The environment that you are forced to live in has taken away much of your humanity and your sensibilities. You find yourself committing crimes to survive and you find yourself committing crimes to sustain your substance abuse. You’re living a senseless life filled with despair and no hope. Put yourself in that situation, assume that you do not know of the tender mercies of Christ. You’re sitting on the street corner in filthy clothes with filthy hygiene and you’re holding a sign asking for money. Someone comes up to you and talks to you while they’re putting money in your hand and they start to tell you about a person who came to earth and he paid the price for all of your sins, and of all the sins of all the people on earth. This man has felt everything that you have ever felt or that you will ever fill. This man has provided a way for you to not only get off the street and not only get into clean clothes but to get into heaven with the righteous. Does this sound too good to be true? If you’re reading this Blog then you know where I’m going with this illustration, but really think what would be like to be in those circumstances and then you are introduced to Christ and his love and his boundless saving grace and mercy, wouldn’t that all seem just a little too good to be true? Well it’s not too good to be true. It is a fact. It is the most blessed fact or truth on the earth. The story of Jesus Christ, and the doctrine contained in the Bible that teaches us about His Life and His teachings are true. Within the book covers of the Bible is the way to the truth and salvation, they are the pathways whereby we can receive eternal happiness. Consider what the word eternal means? The word eternal means “without end.” So think what this means, happiness without end. To live with God and his son Jesus Christ is happiness forever, without end. Even though we started off with the story of the homeless person that appeared to have no hope, each one of us are beggars, we all depend on the same God to give us life, we all rely on that same God to forgive us of our sins and through His grace and His mercy to live with Him throughout eternity. We can all say that this idea is too good to be true. But it is true! So when you hear the old adage “if it’s too good to be true, it is” always keep in the back of my mind that sometimes it can be that good and still be true. 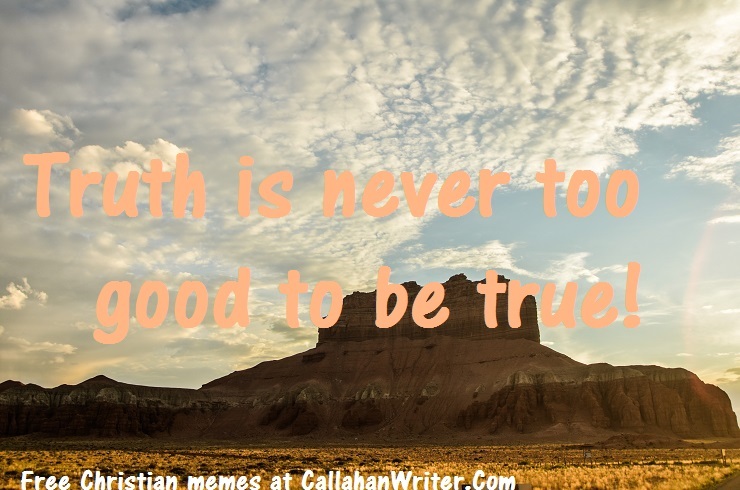 When it comes to Jesus Christ, it is too good to be true but it is true. We all need to remember Jesus Christ our Savior, and our Eternal Father in Heaven love us unconditionally, they are perfectly willing to give us grace and mercy if we are willing to reach out to them.